The ABCC8 gene encodes the sulfonylurea receptor 1 (SUR1) subunit of the pancreatic beta cell ATP-sensitive potassium (KATP) channel. Inactivating mutations cause congenital hyperinsulinism (CHI) and activating mutations cause transient neonatal diabetes (TNDM) or permanent neonatal diabetes (PNDM) that can usually be treated with sulfonylureas. Sulfonylurea sensitivity is also a feature of HNF1A and HNF4A MODY, but patients referred for genetic testing with clinical features of these types of diabetes do not always have mutations in the HNF1A/4A genes. Our aim was to establish whether mutations in the ABCC8 gene cause MODY that is responsive to sulfonylurea therapy. We sequenced the ABCC8 gene in 85 patients with a BMI <30 kg/m2, no family history of neonatal diabetes and who were deemed sensitive to sulfonylureas by the referring clinician or were sulfonylurea-treated. All had tested negative for mutations in the HNF1A and HNF4A genes. ABCC8 mutations were found in seven of the 85 (8%) probands. Four patients were heterozygous for previously reported mutations and four novel mutations, E100K, G214R, Q485R and N1245D, were identified. Only four probands fulfilled MODY criteria, with two diagnosed after 25 years and one patient, who had no family history of diabetes, as a result of a proven de novo mutation. ABCC8 mutations can cause MODY in patients whose clinical features are similar to those with HNF1A/4A MODY. Therefore, sequencing of ABCC8 in addition to the known MODY genes should be considered if such features are present, to facilitate optimal clinical management of these patients. P. Bowman S.E. Flanagan and E.L. Edghill contributed equally to this study. The ABCC8 and KCNJ11 genes encode the sulfonylurea receptor 1 ( SUR1) and inward rectifier potassium channel Kir6 (Kir6.2) subunits of the heterooctomeric ATP-sensitive potassium (KATP) channel in the pancreatic beta cell, which links cellular metabolism to electrical activity of the plasma membrane thereby regulating insulin secretion. Mutations in these genes can cause a variety of phenotypes resulting from overactivity or underactivity of the KATP channel. Recessive loss-of-function mutations in ABCC8 and KCNJ11 are known to cause congenital hyperinsulinism (CHI) . This is characterised by the unregulated secretion of insulin from pancreatic beta cells leading to severe and persistent hypoglycaemia. Further, dominantly inherited ABCC8 mutations can cause CHI with predisposition to insulin deficiency and diabetes later in life . More recently, both dominant and recessive activating mutations in the KATP channel genes have been shown to cause neonatal diabetes. This may be permanent neonatal diabetes (PNDM) or transient neonatal diabetes (TNDM) [2, 3, 4, 5]. TNDM remits but often relapses in later life [3, 4]. 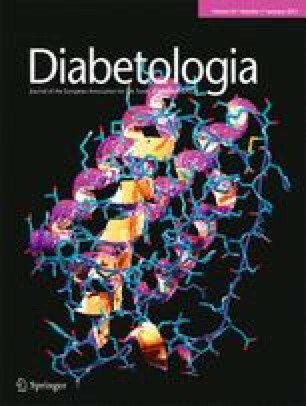 Relatives of probands with KATP channel mutations causing neonatal diabetes can present with diabetes outside the neonatal period; both adults and children with such mutations have successfully transferred from insulin to sulfonylurea therapy [3, 4, 6]. Several studies have suggested an association between adult onset diabetes and mutations in the ABCC8 gene, in the absence of a history of diabetes or hyperinsulinism in the neonatal period. ABCC8 mutations have been identified in an adult cohort of patients with type 2 diabetes diagnosed before the age of 40 years . This study screened 204 probands and identified ABCC8 mutations in four individuals. All four probands were diagnosed in their 30s and one had been treated with glibenclamide for several years. His two children had inherited the mutation; one had impaired glucose tolerance at aged 35 years and the other had normal glucose tolerance on OGTT at 33 years. Heterozygous activating ABCC8 mutations were also identified in two insulin-treated non-obese individuals diagnosed with type 1 diabetes in adolescence . One is the father of a child with neonatal diabetes reported by Babenko et al. in 2006 . Both were able to successfully transfer from insulin to oral glibenclamide therapy at the age of 37 and 63 years, with improvements in HbA1c and C-peptide levels on sulfonylurea therapy. After testing it emerged that the second patient also had a family history of neonatal diabetes. Mutations in the HNF1A and HNF4A genes encoding the transcription factors hepatocyte nuclear factor 1A and 4A cause MODY that can be treated with low-dose sulfonylureas. However, not all patients with clinical features suggestive of HNF1A/4A MODY (age of onset less than 25 years, dominant family history of diabetes, not insulin dependent or obese) have mutations in these genes. Of 2,072 referrals for MODY genetic testing between 1996 and 2009 in the UK only 564 had mutations identified, with 62% of these being HNF1A/4A . No previous studies have investigated the frequency of KATP channel mutations in patients with a MODY phenotype. Given the response to sulfonylureas in patients with neonatal diabetes, we focused our study on a sulfonylurea-sensitive subgroup of patients referred for MODY genetic testing but in whom no HNF1A or HNF4A mutation had been identified. We identified a cohort of patients with BMI <30 who had been referred for genetic testing for MODY, were deemed by the referring clinician to be sensitive to sulfonylureas or were treated with sulfonylureas and who tested negative for mutations in the HNF1A/4A genes (n = 85) by sequence analysis. HNF1A/4A partial or whole gene deletions were also excluded by multiplex ligation-dependent probe amplification (MLPA) (samples analysed as per the manufacturer’s instructions; MLPA kit P241, MRC-Holland, Amsterdam, the Netherlands). We sequenced the ABCC8 and KCNJ11 genes in this group. Individuals with a personal or family history of neonatal diabetes (i.e. diabetes diagnosed in the first 6 months of life) were excluded. Informed consent has been obtained from patients where appropriate and this research was carried out in accordance with the principles of the Declaration of Helsinki as revised in 2000. Genomic DNA was extracted from peripheral leucocytes using standard procedures. The single exon of the KCNJ11 gene and the 39 exons of the ABCC8 gene were amplified and sequenced as previously described . Sequences were compared with the published sequences, NM_000525.3 and NM_000352.2, which incorporates the alternatively spliced residue in exon 17 (L78224). When a mutation was identified, and DNA was available, family member testing was undertaken. Microsatellite analysis (Powerplex 16 System, Promega, Southampton, UK) was used to confirm family relationships when a de novo mutation was identified. When two mutations were identified in a single patient, but samples from both parents were not available for testing, allele specific PCR was undertaken. Briefly, primers were designed to amplify a single copy of the patient’s ABCC8 gene using a primer complementary to the G214R mutation (primer sequences available on request). The PCR products were subsequently sequenced to reveal whether the G214R and V222M mutations were on the same or opposite alleles. No mutations were identified in the KCNJ11 gene but we identified seven different ABCC8 mutations in seven of the 85 probands (see Table 1 and Fig. 1). Four mutations are novel (E100K, G214R, Q485R and N1245D) and affect residues conserved across species, and none were present in the dbSNP (November 2010) or 1000 genomes databases (May 2011). The R1380H mutation (probands 1 and 2) has been reported previously in patients with TNDM [3, 8]. V1523L (proband 5) was previously identified in a patient with PNDM who was a compound heterozygote for V1523L and T229I . The Q485R mutation arose de novo in proband 6 and is novel, although a different mutation at this residue, Q485H, has been reported in a patient with PNDM . Two of the novel mutations, N1245D and E100K (probands 4 and 7), were inherited from a diabetic parent but grandparental samples were not available to check cosegregation. In no instance was a mutation found in a non-diabetic individual. In proband 3, in whom two mutations were identified, allele specific PCR demonstrated that the G214R and V222M mutations were inherited on the paternal and maternal alleles, respectively. Since the V222M mutation has previously been seen in a patient with hyperinsulinism (S. Ellard and S. Flanagan, unpublished data), G214R cannot be an inactivating mutation as this would result in a hyperinsulinism phenotype and not diabetes. The clinical characteristics and evidence to support sulfonylurea sensitivity in the families studied are shown in Fig. 1 and Table 1. Birthweights are known for two probands (3.69 and 3.37 kg in probands 4 and 7, respectively) and these are within the normal range. Two patients had switched to insulin therapy since their referral for genetic testing. Families 1–4 fulfilled MODY criteria in terms of age at onset of diabetes less than 25 years in at least one family member and presence of an autosomal dominant pattern of inheritance (Fig. 1). There was evidence of sensitivity to sulfonylureas in two of these families (Table 1). Probands 5–7 did not fulfil classical MODY criteria, with diagnosis at 36 years (proband 5) or 42 years (proband 7) and no family history of diabetes in proband 6 (Fig. 1). However, all were sensitive to sulfonylurea therapy (Table 1). We have identified heterozygous ABCC8 mutations in 7/85 (8%) non-obese patients referred for genetic testing for MODY. Three of these mutations are previously reported TNDM or PNDM mutations [3, 5, 8, 10], one is an inactivating mutation previously identified in a patient who is a compound heterozygote for a novel, presumed activating, mutation, and the remaining three mutations are novel. The Q485R mutation is highly likely to be pathogenic since it has arisen de novo and a different mutation at this residue has been reported previously . The evidence for pathogenicity of the E100K and N1245D mutations is less certain, and both probands progressed from gliclazide to insulin therapy. Although the residues are highly conserved, functional studies are required to show that the mutations increase KATP channel activity and cause diabetes. Alternatively these may be loss-of-function, recessive hyperinsulinism mutations not causative of diabetes. Eight individuals from five families show good glycaemic control (HbA1c <7.5%) on sulfonylurea therapy at doses lower than the maximum daily dose for the drugs concerned. In families 3 and 4 sulfonylurea sensitivity is more difficult to prove based upon the information available, and the pathogenicity of the mutation in family 4 is unproven. A variable response to sulfonylureas is also seen in patients with activating ABCC8 mutations causing neonatal diabetes, as most, but not all, patients are able to transfer from insulin to sulfonylureas . One patient progressed to insulin therapy in later life, a feature also seen in patients with HNF1A/HNF4A mutations. Since all the patients studied were treated with sulfonylureas at the time of genetic testing, we have not established the prevalence of ABCC8 (or KCNJ11) mutations in MODY. Further work to determine the frequency of KATP channel mutations in insulin-treated patients referred for MODY testing is required, particularly since these patients may benefit from transfer to oral sulfonylureas if a mutation is found. A genetic diagnosis also enables testing for affected relatives to confirm the aetiology of their diabetes and predictive testing for asymptomatic relatives. The de novo Q485R mutation highlights the fact that a family history of diabetes is not a prerequisite for monogenic diabetes and alerts the patient to the 50% risk of diabetes in her future offspring. The identification of ABCC8 mutations in >5% of sulfonylurea-sensitive patients who had previously tested negative for HNF1A and HNF4A mutations suggests that KATP channel gene analysis should be added to the repertoire of tests for MODY. The advent of targeted next generation sequencing may make this a cost-effective approach in the near future. We thank A. Williams (School of Clinical Sciences, University of Bristol, UK) and T. McDonald (Peninsula NIHR Clinical Research Facility, Peninsula Medical School, Exeter, UK) for their help with diabetes autoantibody testing. We also thank E. Pearson (Ninewells Hospital, Dundee, UK), J. Jones (Genetic Diabetes Nurse for Devon & Cornwall, UK), H. John (Genetic Diabetes Nurse for Avon, Somerset and Gloucester UK), A. Dornhorst (Charing Cross Hospital, London, UK), N. Leech (Newcastle General Hospital, UK), J. Hamilton (The Hospital for Sick Children, Toronto, Canada) and P. Bingley (School of Clinical Sciences, University of Bristol, UK) for providing us with their patients’ relevant clinical information. S.E. Flanagan is the Sir Graham Wilkins, Peninsula Medical School Research Fellow. S. Ellard, M.H. Shepherd and A.T. Hattersley are employed as core members of staff within the NIHR funded Peninsula Clinical Research Facility. The research leading to these results has received funding from Diabetes UK and the European Community’s Seventh Framework Programme (FP7/2007-2013) under grant agreement no. 223211, Collaborative European Effort to Develop Diabetes Diagnostics, CEED3. The study was designed by ELE, ATH and SE. PB, MHS and RP analysed and interpreted the clinical data. ELE, SEF, AD and SE analysed and interpreted the molecular genetic data. The manuscript was drafted and critically revised by PB, SE, ATH, SEF, ELE, MHS, AD and RP. All authors approved the final version of the manuscript prior to publication.